NASHVILLE, TN — They don’t call it “music city” for nothing. 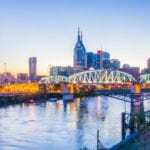 There is no shortage of great music by day or night in Nashville, Tennessee, with some musicians even playing multiple venues in a single evening. CMA Music Festival takes place June 8-11, attracting country music fans from around the world to soak up four days of live concerts by more than one hundred artists, including free shows in the downtown core. If country music isn’t your thing, the enormous Bonnaroo Music and Arts Festival is happening at the same time just down the road in Manchester, Tennessee, hosting 150 musical acts and comedy shows, plus art workshops. Just you and 80,000 friends. The Jefferson Street United Merchants Partnership (J.U.M.P.) announces the lineup for its 17th Annual Jefferson St. Jazz & Blues Festival on Saturday, June 17th, held at the Bicentennial Capitol Mall Amphitheater in downtown Nashville. Headliners of the festival’s main event are Rose Royce, the R&B band with a string of great hits from the 70’s and Shirley Murdock, a soulful singer-songwriter. For free music, options abound: July 4th, the Let Freedom Sing concert, followed by Live on the Green in Public Square Park in August, and the quirky Tomato Art Festival in East Nashville August 11-12th. It’s a timely year to visit Graceland and “Elvis-Land” in Memphis, as August 16 marks the 40th anniversary of Elvis Presley’s death. You’ll want to be in Nashville on August 21st, when this century’s first total solar eclipse sweeps across the country, with Music City directly in its path.